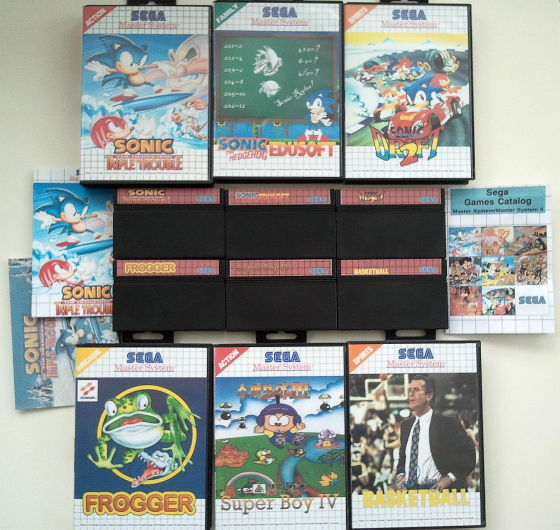 meu2 is a deep-seated Master System fan and collector, located in Ireland, and creates cartmoddings (or reproductions) for the legendary Sega Master System. How he came to this idea and which games meu2 made to date, you can read it here in this big interview! Gordman: Hey meu2, thanks a lot for your precious time for making this interview with me. First of all, tell us something about yourself please. meu2: First of all let me say that it is a pleasure being asked to contribute to your site. I hope it continues to grow over the coming months. 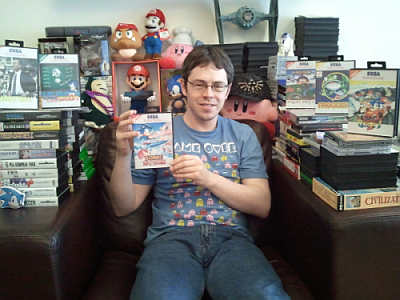 As for something about myself; well I guess you could say that I was born a video game collector! From the moment I played my parents pong clone system I was hooked and video games have been an integral part of my life ever since. It has steered my professional life too, as I became a software engineer due to growing up with video games. I was even lucky enough to pursue a doctorate in networked video games once I completed my undergraduate studies so I have a lot to thank video games for. Gordman: When did you had the idea to create these special (re-)productions? meu2: I believe it was about two years ago. 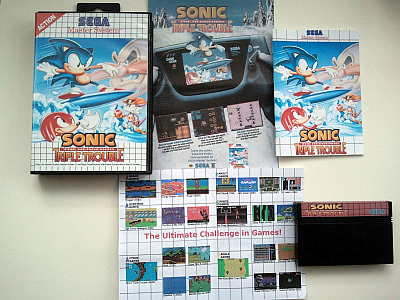 I remember playing the SMS port of Sonic Triple Trouble via emulation and wishing I could play it on a real machine. I still wasn't familiar with home made reproductions at the time, but the idea itself was starting to come together. Around the same time I noticed an eBay seller with a lot of SMS reproductions for sale. I was really tempted to buy a few, but he wanted £45 each delivered to Ireland. However, I would have wanted to buy quite a lot of them and that would have ended up costing a lot of money. In the end I thought why not make them myself? Gordman: Where do you got the knowhow for creating them? meu2: Principally from reading the technical information about the SMS, SMSPower.org is a great resource for that sort of information, coupled with some trial and error. My first few attempts were not a success at all, but I got there in the end. Gordman: Which non-SMS games and prototypes did you put on the western style Master System carts to date? 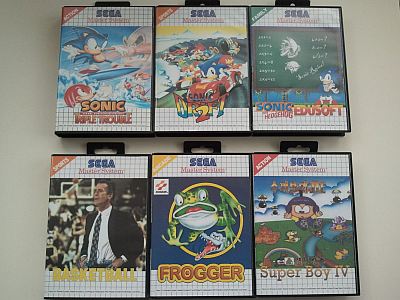 meu2: So far I have made reproductions for Sonic Triple Trouble, Sonic Drift 2, Sonic Edusoft, Super Boy IV, Pat Riley Basketball, Black Belt (Japanese version) and Frogger. To be honest I thought I would have done more by now, but I just never seem to get the time for them! Gordman: I see, there are many titles in your list with Sonic the Hedgehog. Are you a fan of him? meu2: Absolutely, I just couldn't get enough Sonic content when I was younger. I read the comic, watched the TV shows and bought anything I could with Sonic on it. 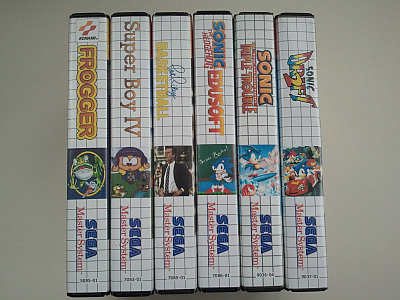 Above all else I loved the games, especially the original Sonic on the SMS. It made Sonic Triple Trouble, Sonic Drift 2 and Sonic Edusoft obvious choices for reproductions. Gordman: Normally, you don´t create instruction manuals for your special productions. But Sonic Triple Trouble has really nice instructions. Why especially Sonic Triple Trouble? meu2: As it was my first reproduction I wanted to create a product that would not only fit in with the rest of my SMS collection, but also reflect what it would be like if Sega were still producing SMS games today. That's why I decided to create a modern Sega Catalog and a full colour manual for Sonic Triple Trouble. I would actually like to create instruction manuals for all of my games, but it took so long to create the Sonic Triple Trouble manual that it's not really practical right now to do it for every game. Gordman: I know you like the prototype of Pat Riley Basketball. What´s the “goods and bads“ in this proto, what do you think? meu2: I actually view all prototypes as good regardless of the gameplay experience since they also serve as a means of preserve the past. If I had to pick my favouite SMS prototype though it would probably be Hook, which is a nice action platformer that was virtually completed before being cancelled. Outside of the SMS I quite enjoy the Starfox 2 prototype for the SNES, which offers a really interesting insight into the evolution of the Starfox franchise. Gordman: One of the latest games you´ve put on a cart is Frogger, another prototype. What do you know about this Frogger game and why you choose the little famous frog for one of your projects? meu2: I've always enjoyed the original Frogger. It's a simplistic arcade experience, but it's good fun and the character has a wide appeal. The Game Gear prototype is a novel take on the Frogger formula, as it introduces new enemies, different levels and a new family member rescue mechanic to freshen things up. It was unfortunate that licensing issues between Sega and Konami resulted in the game being shelved so I figured it was time to right that wrong. meu2´s reproduction set - Front covers..
Gordman: Your opinion: How important is it to search after prototypes and make them available for players? meu2: I think it's very important to search out prototypes and preserve them for the future. Unreleased games are part of the folklore of video gaming and I believe they deserve to be remembered and if possible made available for people to experience. At the very least we should strive to preserve these games digitally, but it's also nice to experience them on the original hardware too. Personally I still hope a prototype of Lemmings 2 for the SMS will be found one day. The game was completed, but the publishers decided it was too late in the SMS' lifespan to release it. Apparently it's a very good conversion of the Amiga game according to the developer so it would be a shame if it was lost to history. Gordman: Ok ok, I admit that I´m excited now (forgive me): What will be your next project? meu2: I'm afraid I can't really go into that right now. If everything goes to plan my next reproduction is going to be somewhat different to my previous efforts, but its still a long way off. Gordman: Are there any japanese games which could be one of your future projects? Gordman: Now comes a question many people talk about:: The word “reproduction“. If that subject appears, people have extreme divided opinions. They think that reproduction means faking original games and sell them for big money. But why is the word reproduction not that bad as some people think? meu2: I think it's partly down to confusion over the term reproduction itself. When people hear the word reproduction they often think of people making copies of existing games and trying to make a quick profit on eBay. In general I'm not too keen on these projects, especially the profiteering aspect connected with them. Personally I stay away from these types of reproductions. All the products I make are probably better described as new production games since they never existed on the SMS. In other words, I stick to prototypes, translated games, non-western cart SMS games and ports for my reproductions. However, I can understand why people would buy reproductions of existing games too as it gives them an opportunity to experience a game that may otherwise be out of their reach. For example, not everyone can afford to buy a copy of the Smurfs 2 on the SMS so a reproduction can serve as a cheaper way for these people to experience the game. Of course, these reproductions should be clearly marked to distinguish themselves from the genuine article. A lot of collectors are afraid these reproductions will flood the market making it difficult to spot the real game when it appears. This is an understandable concern. For the moment I don't believe there are any reproductions that are completely indistinguishable from the original item, but people do need to be careful when buying rare games to ensure they get a legitimate copy of the game. Gordman: There are some Master System fans out there, who creating artworks themselves. Which program do you recommend for creating artworks, what´s your tip? meu2: I personally use Paintshop Pro, but Paint.Net, Photoshop and Gimp will all do the job just as well. I would probably recommend starting with Paint.Net though since it's free to download and fairly straight forward to use. Gordman: I´m sure you´ve heard from the SMS Power! coding competitions, where you programming an 8-bit game and take part with it in a contest with other programmers. If the right guys would contact you if you like to participate with them in a team, would you do it? meu2: I would definitely be interested in participating in a SMS development team and I actually thought about doing some SMS coding before, but I just never found the time for it! Gordman: We are near the end of our interview now. Do you have a special message to the world of video gamers out there? meu2: I guess I would ask video gamers out there to take care of their games, you never know when you might have something rare or unusual. I would also like to take the opportunity to mention my YouTube channel: meu2 - Irish Nerd Life. I do many different types of videos, such as gameplay commentaries, packages & pickups, collection overviews and tag responses, and it's the first place I show each of my new SMS reproductions too. Thanks meu2, I hope it was the same fun for you as for me!